The Dayak Kanayatn indigenous people in Landak regency, West Kalimantan, have accelerated efforts to identify the boundaries of their customary territories. In the last two years, six binua have produced territorial maps equipped with their respective profiles as part of the administrative requirements to attain recognition from the state. Binua is a territorial unit of a customary government and its people that is autonomous. They include hamlets that share similar histories, origins and cultures. A binua is led by a timanggong. As many as 240 people, consisting of customary figures and residents from 17 binua in 14 villages, as well as representatives from the local administration, participated in a two-day bahaupm aya (customary consultancy forum) in Sengah Temila district, Landak, last week. 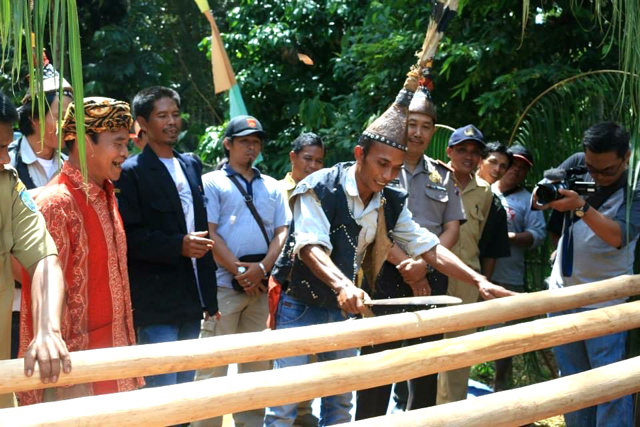 A customary ritual called bapadah ka’ pama ia tanah (telling the ruler of nature) was performed to kick off the forum, in which six binua maps and profiles were handed over to the local officials. The locals also conveyed their hope to receive recognition and management rights over their respective customary territories. Djaiyang, the timanggong of the Tumila binua, said participative mapping activities had been carried out in collaboration with NGO activists. The NGOs helped them identify and create the profiles of the binua that also contained information on natural resources. managing the land and natural resources based on our local wisdoms,” Djaiyang told The Jakarta Post. The six binua are Tungkasa, which covers an area of 3,908 hectares, Tumila (1,596-ha), Rege (3,173-ha), Bahumukng (1,747-ha), Talaga (3,776-ha) and Soari (5,585-ha). These binua are administratively under the jurisdiction of four villages, namely Andeng, Senakin, Aur Sampuk and Paloan, all in Sengah Temila district. For two years, NGO activists grouped under the Pancur Kasih Empowerment Movement Consortium have assisted locals in carrying out the participative mapping. They provide advocacy, research and promotion of nature conservation. Senakin village head Mardiro said the mapping activities were part of the customary people’s struggle to protect their living space, in addition to efforts to improve capacities in identifying and sustainably exploring natural resources while also preserving local customs and cultures. “The participative maps and social data profiles of the six binua are expected to be used by the authorities when making decisions regarding public policies, including spatial planning,” he said. An activist under the consortium, R. Giring, said President Joko “Jokowi” Widodo’s administration’s commitment to accelerating the settlement of tenure problems and land conflicts was a move in the right direction. The government has recognized 707,000-ha of land as customary forests nationwide. “This effort should be followed by various efforts to promote participatory protection of the customary territories,” he said.